These three smartly reissued documentaries -- assembled by the German label Arthaus Musik -- contain many insights into the work and lives of these important 20th century art figures. Art does not appear from a vacuum, a fact underscored by viewing these unrelated films as a group. For example, we learn Jackson Pollock was influenced early on by the work of Diego Rivera, Frida Kahlo's husband. Andy Warhol, in turn, featured Pollock-like drips on his earliest soup can paintings, under the impression they were necessary to identify his work as "art". Warhol was relieved when the art dealer Ivan Karp suggested the drips could go. These three smartly reissued documentaries -- assembled by the German label Arthaus Musik -- contain many insights into the work and lives of these important 20th century art figures. Frida Kahlo, made in 1982 (near the start of the artist's critical reevaluation), begins by stating that Kahlo painted some 70 self-portraits over the course of her career, and "they chart not only the changes in her face and feelings, but also the events in her life". The terrain of the film is thereby staked, as it is either a biography illustrated by self-portraits or an analysis of Kahlo's paintings contextualized by life history, depending on one's point of view. There's much sharp observation at play, whether framing details of her paintings or the accumulated objects scattered through the home Kahlo shared with Rivera, now a museum. Iconography informing Kahlo's work, specific to her Mexican heritage, is also highlighted, with appropriate location footage and the steady intonation of the narrator, the lone voice of the film. While certain aspects of Kahlo's turbulent life seem downplayed (her radical politics, for example), the film succeeds with an unflinching and sensitive analysis of her work. While some viewers will find the interpretations at times heavy-handed or even questionable, others, particularly those less familiar with Kahlo's output, will appreciate the insights as an entry to at times obscure symbolism. The film is solid on the connections between Kahlo's paintings and her life situations. The art is featured prominently. Kahlo is quoted on her inclinations: "I paint self-portraits because I am the person I know best. I paint my own reality… I paint because I need to, and I paint whatever passes through my head without any other consideration." A similar passion for self-expression informs the work at the center of Jackson Pollock. "A method of painting is a natural growth out of a need," we hear him say. "I want to express my feelings rather than illustrate them. Technique is just a means arriving at a statement". A key member of the mid-century Abstract Expressionists, Pollock was known for his large non-representational canvases -- amalgamations of lines, swirls, and drips –- as well as his equally outsized persona. Despite his success, Pollock's life, even as seen in this sympathetic 1987 portrayal made for Britain's South Bank Show, seems a bit of a muddle. Of the three films, Jackson Pollock assumes a structure closest to a conventional public television documentary. The film begins by establishing Pollock at the height of his career -- living on Long Island amidst an extended community of hard-living artists -- before backtracking across his life's story. A case is made, through some clever dissolves, for a relationship between the western landscapes of Pollock's youth and his later huge paintings. This is potentially compelling, but is undercut by the artist's own insistence that his work was wholly an expression of his inner unconscious mind. We learn he was in analysis every year from 1937 until his death, age 44, in 1956. The notion that the car accident which took his life was a form of suicide ("suicide and alcoholism" are identified as attributes of the Abstract Expressionist movement), is presented both as a romantic end to Pollock's life, and also an ingredient to a "value structure" grading his work posthumously. Pollock's wife, Lee Krasner, is credited for skillful manipulation of his estate, resulting in the rising monetary valuation of his work in the decades since. 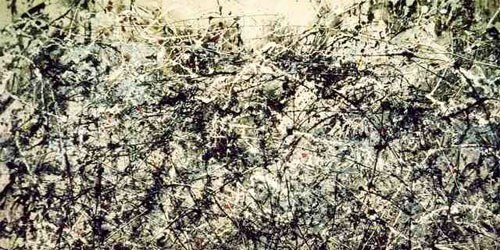 The muddle with Pollock is that his technique, rather than "just a means", overwhelmed the output, in that the form was the content. As Elaine De Kooning points out in the film: "Definitely part of Jackson's success was his cowboy image. Throwing paint down and reckless and abandoned and so on." Footage of Pollock at work retains a sort of appealing romantic grace, the effect of which is not weakened even as we listen to a former neighbor describe the "bombed" artist weaving over a new work. There is an undeniable power and vitality to Pollock's great paintings, even as their scale is diminished via the television screen. Rather than self-portraits, Andy Warhol painted soup cans and later, portraits of other people, usually complete strangers. Though not an intellectual artist, Warhol presented a conceptual art and practice worlds removed from the aesthetic concerns of Pollock's time, just a few short years earlier. Marcel Duchamp: "What is interesting about Warhol is not the retinal image of the man who paints 50 soup cans, but of the man who has the idea to paint 50 soup cans." Emile deAntonio: "Andy finally pulled the rug out from everybody by saying this thing is a thing we call a painting, and it makes no difference what it is and anybody can paint it. In fact, nobody has to paint it. My assistant can paint it." Also initially created for the South Bank Show, Andy Warhol: A Portrait of the Pop Art Idol was filmed just a few months after Warhol's death in 1987. The documentary features a fascinating array of archival footage, film excerpts, and commentary from many of Warhol's closest friends and collaborators. A distinct visual style is achieved by positioning interview subjects low in the frame, with Warhol artworks hovering large in the background. Snappy montages punctuate the biographical and aesthetic conversation. The documentary briefly traces Warhol's modest early life in Pittsburgh, where a talent for drawing would emerge and lead to a career as a commercial artist in Manhattan ("he became the best shoe drawer in New York"). As Warhol's ambitions take him into painting, and then further into the multi-media collaborations identified with the Factory, the assembled recollections retain a palpable excitement even two decades removed. Newsreel footage features Warhol's blank face and detached observations about his own work. The Velvet Underground, Edie Sedgewick, and a host of celebrities and hangers-on are seen cavorting in the Factory before Warhol's movie camera. His turn to making films is identified with a fascination for celebrity glamour, even as the subjects and subject matter appear to defy such notions. There's a notable before/after break in Warhol's creative output after he was shot in 1968. The licentious atmosphere of the Factory at its peak fades, replaced by a more traditional business model as Warhol ventures into magazines, television, and commissioned portraits. Gerard Malanga suggests that "the people that Andy surrounded himself with in the latter part of his life were people that never really contributed anything to his art work…(earlier) he was involved with people who did contribute in a very major, substantial and viable way… and I think his art suffered... He became a bit of a court painter." But Warhol had also found, where Pollock couldn't, another direction to follow. The film finds time to present a healthy variety of opinions on these years, as well as continuing the presentation of a large collection of archival materials. 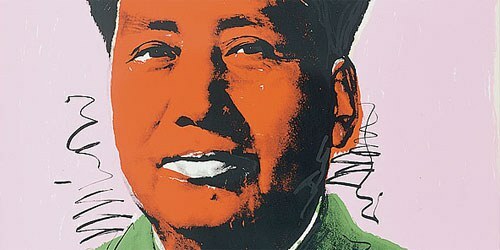 Andy Warhol: A Portrait of the Pop Art Idol gets top marks for tracking down such a generous selection. Each volume has a similar handsome design. The extras are modest but appropriate: a brief essay in an attendant booklet; a picture gallery featuring pertinent paintings and other visuals to complement the film; and three intriguing trailers highlighting other releases of what appears to be a rather extensive collection of art documentaries. Based on the films reviewed above, one might assume that high quality is uniform across the series, even as each title holds its own unique insights.